I have always had an interest in the medical/health environment and since I can remember I carried the wellbeing of people in my heart. On nearing the end of high school I had to make a decision on what to study. My initial interest was speech therapy. I called on a few speech therapy practices and became even more fascinated in following this as a career, on seeing how compassion and therapy can make a difference in the lives of people. Unfortunately my application for enrolment for the speech therapy degree was not successful. This was obviously a huge disappointment at the time, but being adamant on obtaining a tertiary qualification I decide to follow a BA Publishing Degree, more out of desperation than design. After I finished my degree I went to live and work in the UK and it was during that time that I seriously started thinking about my career. It was also during this time that I became a fitness fanatic and was encouraged to become a Personal Trainer. I undertook a Personal Training diploma by following a correspondent learning course but I soon realised after returning to South Africa that personal training as a career is not financially feasible and I had to look for better options. An opportunity came along in a Marketing position and I soon became very interested in the aspects of Marketing and furthered my studies in Marketing & Marketing Management. I have now been working for the South African Medical Association for ten years and during the last couple of years I have been growing more and more the need and desire to broaden my horizons and that I must start to search for new opportunities. Last year I went to visit a school friend of mine who has been living in the UK for more than 15 years. She started her own Colon Hydrotherapy Clinic (Kent Detox Clinic) in 2011. I was curious to know more about her business, how she started, the training she underwent and I asked her opinion on me opening up my own clinic in South Africa. She was excited about the idea and encouraged me to do so. 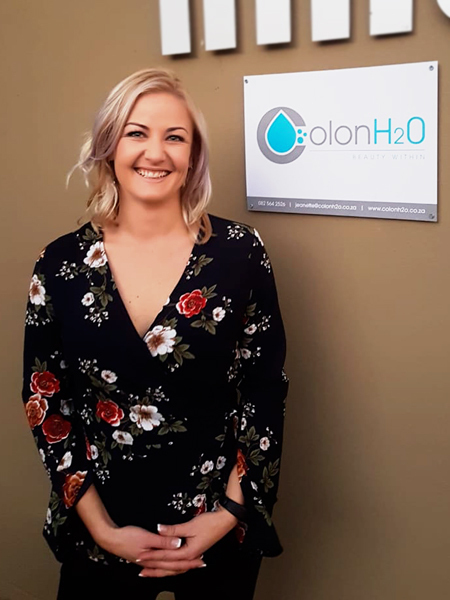 On returning to South Africa I started doing my own research on Colon Hydrotherapy, with special attention to the number of clinics available in South Africa and specifically in Pretoria and surrounding areas where I stay. As part of my research I went for my own first treatment and was absolutely amazed on how good I felt afterwards. Having had to rely on laxatives since the birth of my son, it was a complete bliss to experience the “natural way” and since my first colon hydrotherapy, it has never been required for me to rely on any form of laxatives. Having made up my mind that this is something I want to persue, the next question was; “where do I get my hands on study material?” and thanks to my friend in the UK she referred me to you. Since starting with my studies and the more I learn, the more I have become fascinated in Colon Hydrotherapy and how this therapy can change and bring joy to those suffering from colon dysfunctionality. It is such an amazing process to care for your digestive system. There are so many people out there who suffer from constipation and many other digestive disorders and it affects not only their health, but also their mental state – I hope I can make a difference in your life!